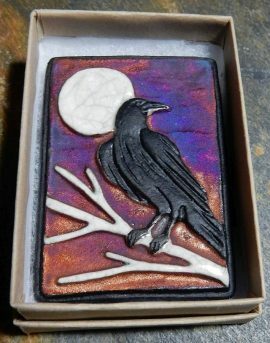 You can enjoy this unique beauty of this Raven, Raku Pottery Wall Art or Magnet is handmade. Raku tiles are decorated in assorted glazes, with copper gloss, copper matte, crackle and smoke black. Each tile has a magnet and a loop for hanging. 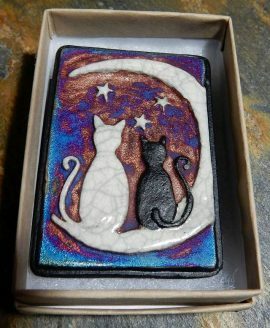 You can enjoy this unique beauty of this Cats on Moon, Raku Wall Art or Magnet is handmade raku tiles decorated in assorted glazes, with copper gloss, copper matte, crackle and smoke black. 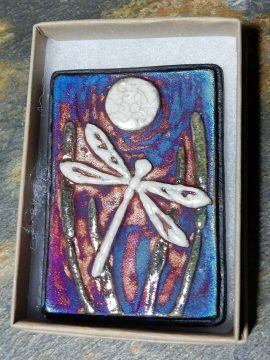 You can enjoy this unique beauty of this Dragonfly, Raku Pottery Wall Art or Magnet is handmade raku tiles decorated in assorted glazes, with copper gloss, copper matte, crackle and smoke black. 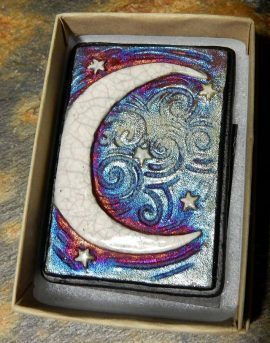 You can enjoy this unique beauty of this Moon, Raku Pottery Wall Art or Magnet is handmade raku tiles decorated in assorted glazes, with copper gloss, copper matte, crackle and smoke black. 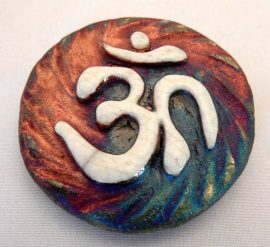 You can enjoy this unique beauty of this OM, Raku Pottery, Medallion is handmade. Raku Medallions come in assorted crackle colors and copper gloss glazed. Each one is crafted by hand. 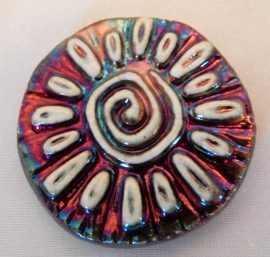 A colorful raku sun medallion is a perfect keepsake for yourself or someone you love. Medallions make perfect little gifts for friends, family, coworkers, or classmates – especially when you need several small gifts for a group of people. Raku Medallions come in assorted crackle colors and copper gloss glazes. Each one is crafted by hand. Each medallion is a unique work of art and will not be exactly like the one pictured. We will pick a beautiful one out just for you.